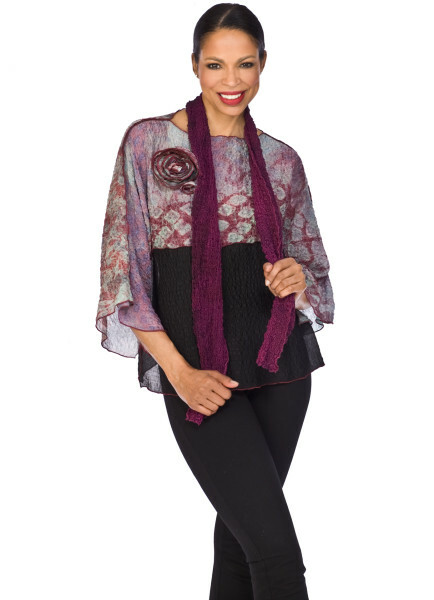 As a fiber artist and designer, Peggy Koop uses the finest silks, the softest wools, and the sheerest cotton to create wearable art pieces you can immediately touch and wrap yourself in to enhance any outfit on any occasion. The tactile and sensual qualities of her scarves and shawls come from the various fusing techniques she uses to combine the oldest natural materials known to man: silk, known for its richness and luxury; wool, known for its warmth and comfort; and cotton, known for its versatility and softness. The result is comfortable luxury and a delicious treat for the senses. Peggy enjoys working with fabric, carefully hand-dyeing yards of it and then enhancing her work with embroidery, printing, and silk-screened surface design. She continues to explore the visual effects she can create on cloth by experimenting with various techniques to showcase the colors of nature.